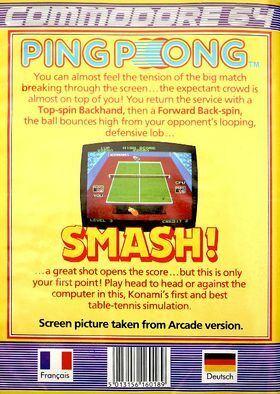 Information Alternative names: "Ping-Pong", "Konami's Ping-Pong" and "Smash Ping Pong"
7.20 points at 10 votes (rank 295). 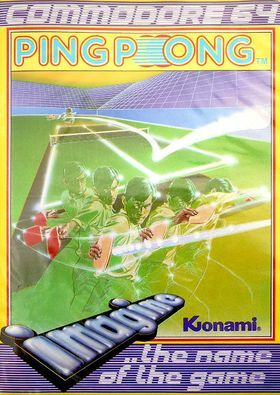 Konami brought the table tennis simulation Konami's Ping Pong to the arcade halls in 1985. Thirteen years after Atari's minimalistic Pong machine, the "fastest bouncing sport of the world" became with this playable on the screen with coherent rules and realistic course for the first time. The machine was probably not without success as in the following time several official conversions were made for home computers and game consoles. There were ports within a short time amongst others for MSX, Amstrad CPC, Commodore 64 and the ZX Spectrum. 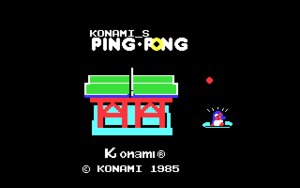 In 2009 there were releases of the NES version Smash Table Tennis on the Wii Virtual Console and in 2010 under the original name Konami's Ping Pong in the Game Room for Xbox 360 and Windows PC. 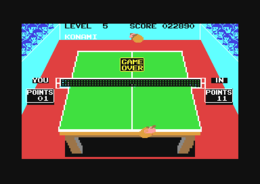 The Commodore 64 version was developed by Imagine Software and was published in 1986 under the name Ping Pong. 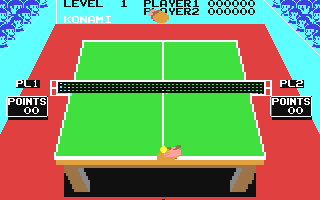 The player can choose to compete in a table tennis match either against a human player or the C64. The computer opponent has five different difficulty grades. Ping Pong consist only of five different screens. 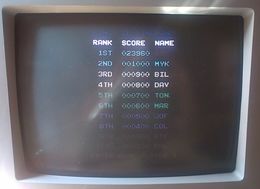 The animated title screen is followed by a start menue, in which the number of players and the game speed (level 1 to 5) can be set. 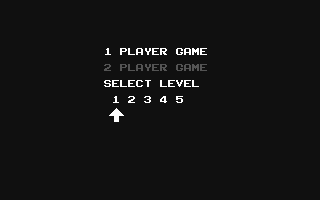 In the two-player mode, the intermediate and end results are shown after every set. After the game you can enter your score into the highscore liste. The fifth screen shows the actual game area. This is static for the most part, but in return it is coherent concerning the colour and well suitable for an undistracted game of table tennis. The only moving elements are the two table tennis rackets and the ball. Naturally, the main part of the screen is taken in by the green table tennis table (also named table). The perspective view on the table is shown by a camera at the ceiling behind the player. By this, the game stays clearly-arranged and the ball's flight path can be recognized well. Table tennis was only little commercialised in the 80's. You can recognized this in the minimum of perimeter advertisement, but also in the colour of the table. Today they use mainly blue tables for important matches, as the contrast to the advertising space is better. The yellow ball seems a bit big compared to the diameter of 38mm that was usual at that time (balls with the size of 10mm were only introduced in 2001). The ball's shadow always shows its height above the table. By this, the visibility of the ball is optimal also in hectic situations. Unusual for European eyes, both rackets are held in the Penholder style. In Europe more Shakehand style is played. The Japanese company Konami has probably due to culture naturally decided for this type of play which is common in Asia. But also seen from the programmer's view is this choice combined with advantages. As players of Penholder style do only need one side of the racket, the number of required sprite animations can be halved. Vertically mirrored sprites make both correct forehand and backhand views. On needs to compliment the audience. During the rally, the blue chaps keep exemplarily calm. In return they celebrate each scored point with so much more enthusiastic applause and whistling. There is only music at the beginning and the end of each match. Otherwise you can only hear ball sounds which are helpful for the timing of the strikes. 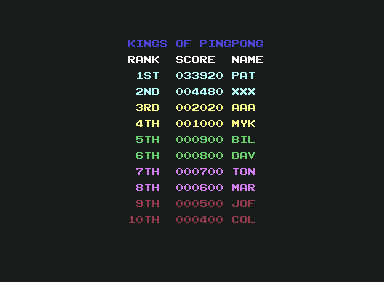 The Ping Pong manual lists items and table tennis rules, as they are partially used in the game for the score. The single player meets a stronger computer opponent after every set won (level 1 to 5). If he loses a set, the "GAME OVER" will appear immediately. In the two-player mode the game ends when a player has won two sets. ("BEST OF THREE"). To win a set, a player needs to reach 11 points with at least two points ahead. Otherwise the game is continued until one of the players is 2 points ahead or has 15 points. Alternation of service is usually done after 5 points. But if a tie (DEUCE) has been reached, the service is changed after each point. Due to equivalent opportunitites, the two human players swap the table sides after each set. A single player is always on the same side of the table. Next to the table tennis score, there is also the score relevant for the computer game. This score can allow you to enter your name into the highscore table. Each correctly played ball gets you a score of 10. Gaining a point directly (IN) gets you a score of 500. The opponent's mistakes (OUT, NET) do not get you any points. A single player uses the joystick in port 1. When competing against a human opponent both joystick ports are needed. Bevor servicing, the racket can be moved to the left or right with the joystick. 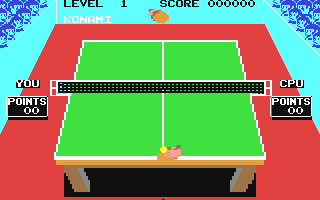 In the game, both table tennis rackets move automatically to the ball along the baseline. The type and point of the time of the strike decide the ball's direction, distance and speed. Move racket to the servicing position. Press joystick sidewards to choose forehand or backhand. Press joystick forwards to throw the ball into the air. or press the fire button for a speedy service. The time when hitting the ball determines the flight path and distance of the ball. The key to table tennis success is the perfect timing of the strikes. As in real sport you get the necessary feeling for the ball by practicing a lot. A strike needs to start already before the ball reaches the racket. Faster balls need to be hit earlier. The computer (level 1) can be provoked to high balls by slow strikes (CUT). High balls make a cartoon-like sound and should be smashed (SMASH). Otherwise smashed balls should be avoided as they land in the net too often. A smash from the opponent is best countered with an early strike (CUT or DRIVE). Marvin: "Challenging for single players in level 5, for mulitple players with the necessary haha factor. Ping Pong contains everything that makes a table tennis match. I always liked playing it. 8/10". Konami's mascot Pentarou has a cameo appearance in the stunning title animation. In contrast to the arcade machine version can the cute penguin not be recognized in the audience. 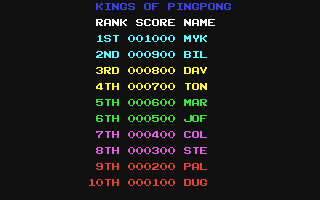 The built-in highscore list has the title "KINGS OF PINGPONG". In the Remember version of the game you can save the highscore list. Ping Pong in the Killer List Of Videogames. This page was last modified on 17 May 2015, at 11:47.